Festival of the Dead is featured in this fantastic North Shore Sunday article. This article means a lot to us because it shows how some in this former Puritan town have learned to embrace their Witches, but others have not. Both Salem Chamber of Commerce director Jeff Worthley and Salem Main Streets Director Deborah Greel spoke highly of the Festival and October tourism in general. Sadly, both Worthley and Greel were urged to resign in early 2005. Some say that it was due to their favorable opinion of Witches. A lot has changed since 1692, but we sure have a long way to go before our city really comes to terms with Witches. Festival of the Dead collaborators are at it again: planning their second spooky, hopefully shocking, 10-day festival, aimed to attract witches and spooks and those looking for a good scare. Friday was the kickoff, with a Night of Necromancy, where Shawn Poirier, high priest of the Salem Witches, led the group through the dark teachings of the spirit world, including trance dancing and rituals to summon the powers of the dead, and more importantly, offered decadent hors d'oeuvres and a clear path to the cash bar. Other events, leading up to Halloween, include seeking the magic of fairies, a Vampire's Masquerade Ball, understanding the history of the Ouija board, dining with the dead, and even teaching children how to talk to spirits and use magic wands. Like last year when the Associated Press, the Travel Channel, VHI and an Italian network showed up, this year the organizers—admitted media whores that they are—say they have lined up Boston Magazine to attend one of the bigger events, the filming of a British TV show called "Dead Famous." The show will do one of its dead-celebrity conjurings on Bette Davis, who hailed from Lowell and spent lots of time in Salem (who knew?). This week, festival organizers were scheduled to be on Jon Stewart's "Daily Show." Also, people from the Food Network are slated to come, but organizers aren't sure why. All month, festival organizers and their recruits have been hanging posters and strutting their stuff on the city's historic streets, reveling in their favorite time of year. "We're out there on the streets being visible to our many fans and tourists who come here year after year," says Poirier. "They think this year we look better than ever." Poirier says he even paraded around King Richard's Fair in Carver, where at least 100 people came up to tell him they are excited about the Salem festival, which has grown from nine to 16 events. "We've gone from this little New England festival to being known across the country," says Poirier. This year's Witch's Ball is themed "Malice and Wonderland," playing up the strain between the different kinds of people in Salem who call themselves witches and those who have given all of them a bad name, says Poirier. "We're bringing in witches from around the world to stop the madness and set Salem right," he says. 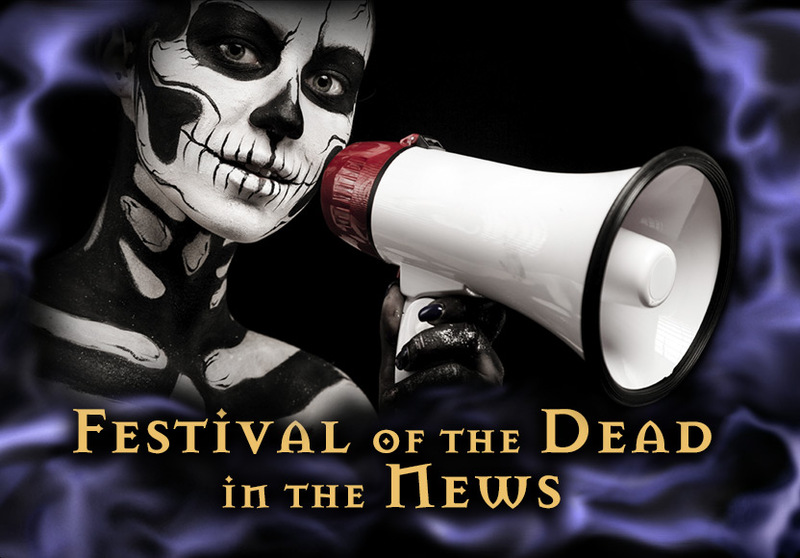 The Web site advertising the event (festivalofthedead.com) proclaims "The looking glass has shattered" and "The house of cards has fallen," describing the city's problems with its witches, who just don't get along. "Look what Christian and I have done in two years," says Poirier, referring to his co-coordinator, Christian Day. "We're unifying the witch community. People have a right to practice witchcraft however they choose. Witchcraft is first and foremost about magic, about telling the future and about healing others who have been wounded." Poirier describes the festival's mission as a "cross-cultural" look at Halloween, the season of death and the celebration of it. "Drink from the passion of life as much as you can, because death is following us," he says. "Look at the sun, feel the crisp air, make love to your lover, enjoy food and live today to the fullest." Meanwhile, it seems these witches' smarts and their masterful marketing and personal skills are finally being recognized by the city of Salem. While a year ago their membership was rejected by Destination Salem, a non-profit agency made up of local businesses—as Day put it, they were told by one city official that they bring "T-shirt-wearing zeros" to Salem—this summer they joined the more traditional Chamber of Commerce, where they were welcomed with open, albeit uncloaked, arms. "We're very happy they became members," says Salem Chamber of Commerce executive director Jeff Worthley. "We are not allowed to discriminate against any member who wants to join. There are chambers who've gotten in trouble for picking and choosing. That being said, we're glad they've joined. They've add a nice flavor to the soup, if you will, and we're happy they're finding us a good resource." Says Poirier, "Witchcraft is about being a vital part of the community and about using our magic, our art and creative talent to generate money and business and provide our tourists with fun." Worthley says the chamber doesn't buy into the T-shirt-wearing-zeros theory, but rather believes that when high-end restaurants, hotels and bed & breakfasts do their best business in October, that says something. "I think the people who are coming here are far more educated, cosmopolitan and willing to spend money than people give them credit for," says Worthley. "We are supportive of any effort that brings more people to Salem. I disagree with this whole argument that the people who are coming to witch-related events are not the high-end type of people we should be attracting." Each October, an estimated 500,000 people visit Salem, 10 times the city's population. And as of last week, Worthley says business, as far as foot traffic, reservations and just the general high level of energy, is shaping up to be better than last year. In September, Day, Poirier and their marketing guru friend, Bob Murch, launched a newsletter cleverly called "The Scarlet Letter." It accompanies their gravestone motif Web site, hauntedsalem.com, a tourism site originally started to compete with other local sites. Haunted Salem aims to offer the spooky, haunted elements of Salem, promoting Halloween every day of the year, while most of the other Salem sites guide Web surfers toward the historic seaport side of the city. Perhaps because of their focus on the one thing they say makes Salem truly unique, the Salem witch trials, their site has more than 1,000 subscribers, says Day, and gives information about lodging, shopping and spooky events to site visitors looking to make informed decisions about their visit to Salem. "Bob calls every business in town and asks for calendar listings," says Day. "It doesn't matter if they are friends, enemies or somewhere in between. If they offer to list something, we list it." The only place to outright refuse this free service, says Day, has been the House of Seven Gables. "But that's obvious because they are working with the Peabody Essex Museum to try to destroy Salem's Witch City identity," says Day. "Obviously, they do an outstanding Salem witch-trial presentation, but they are trying to snuff out the spooky part." Stanley Burchfield, executive director of the House of Seven Gables and president of Destination Salem, the organization that hosts Haunted Happenings—"America's Halloween Festival"—for three weeks in downtown Salem, declined to comment. Meanwhile, Deborah Greel, executive director of Salem Main Streets Initiative, is reporting some positive interactions with the city's witches. "We got to know each other through the controversy of the poster. Well, this year's controversial poster," she says, recalling her recent acquaintance with Poirier. "He came into Main Streets. I said 'I really don't like this poster. The city is working to take it down immediately.' "
The poster was for the Oct. 29 Vampire's Masquerade Ball and of a woman, provocatively posed, with blood all over her. "I just thought that was not a family friendly message in our downtown. We met over something controversial that I didn't like and then started a conversation," Greel says, admitting she wasn't quite prepared for Poirier's sense of cooperation. Eventually, the two started a dialogue that turned into Poirier offering to do tarot-card readings and help decorate at last Friday's Main Streets Halloween Dance at Old Town Hall. Before they knew it, the two were up to their knees in a pumpkin patch, laughing and bucking bails of hay into the back of a truck to prepare for the event. "She took the time to actually know us," says Poirier. Though Poirier and Day have done their best to play up controversy in the past, that doesn't mean new relationships can't be forged, says Greel. "I think they've pushed the envelope, but they're seeing the city doesn't want to get rid of the Halloween events," she says. "Both Christian and Shawn have offered their skills in marketing to help Salem be a year-round destination for all businesses." Now, Greel is even considering attending the Vampire's Masquerade Ball.